The Hobbit film trilogy was no Lord of the Rings - that's a given. It's a given because the Hobbit book was no Lord of the Rings. But there were moments of brilliance in the movies, and some terrific characters as well. For me, the best thing about the Hobbit movies weren't the hobbits, but the elves. They were some cool - if aloof - dudes and dudettes. Both Tauriel and Thranduil were highlights, and Asmus already produced the former, albeit with some issues. 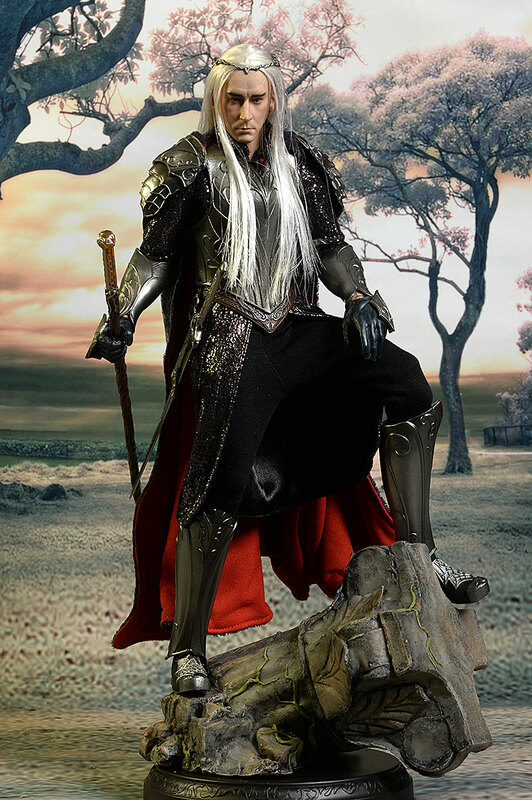 Now they have released the ElvenKing in all his glory, and his progeny Legolas is coming soon to complete the triad. 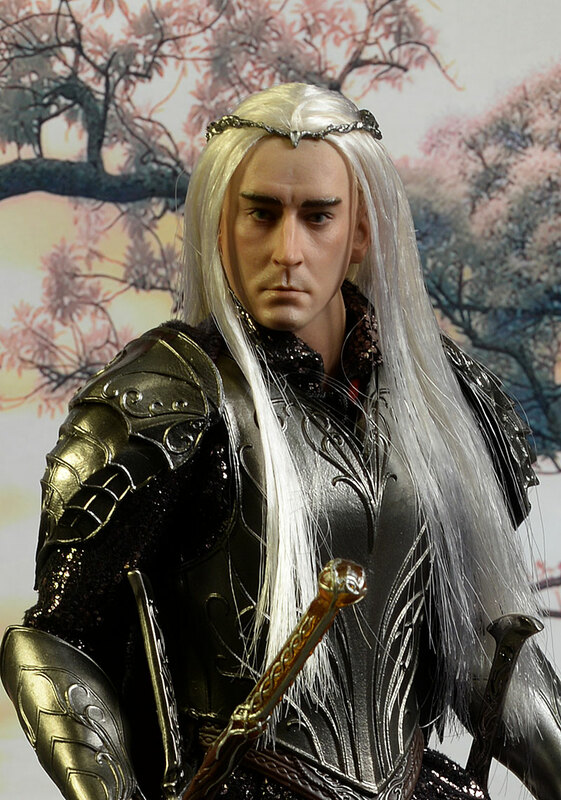 Thranduil is currently shipping, and will run you around $200 depending on the retailer. Occasionally, Asmus does exclusive versions, but that's not the case with this release. This figure is an actual limited edition of just 600 figures. 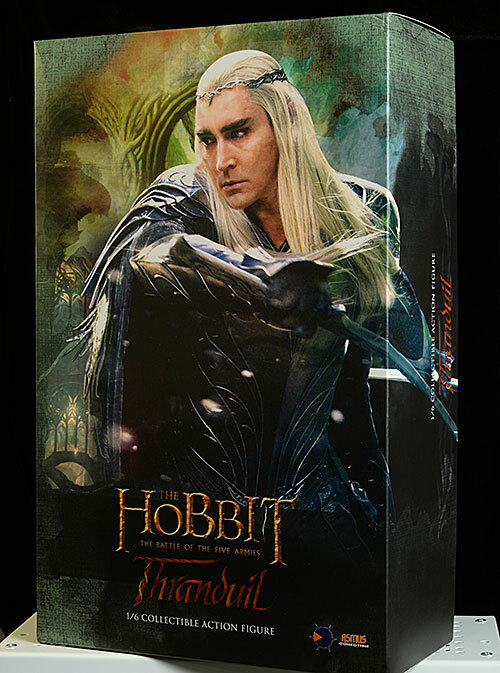 The box art shows off Lee Pace as Thranduil, as he battles Orcs and other nasties. It's a pretty basic shoe box design, but the accessories are very tightly held within a couple plastic trays within. The vacu-form style of these trays lends itself to this very tight, very secure enclosure. There's also a cover card inside the box, and one of the nice touches by Asmus is the inclusion of the edition size and number on this card. They've turned it into a COA of sorts, albeit a big one. Everything is collector friendly as well, as you'd expect from any high end sixth scale company. This might be of some debate, but that's because there is a distinct difference between 'right out of the box' and 'a bare amount of futzing'. The only photo I've included of the figure as he is right out of the box is the one below. They went with all rooted hair here, and I'm very glad they did. Considering how long it is and how fine it is, rooted hair was really the only way to go. And they learned their lesson with Tauriel, where they tried to combine sculpted hair and rooted hair and came up short. The rooted hair allows for lots of futzing - encourages it, even. 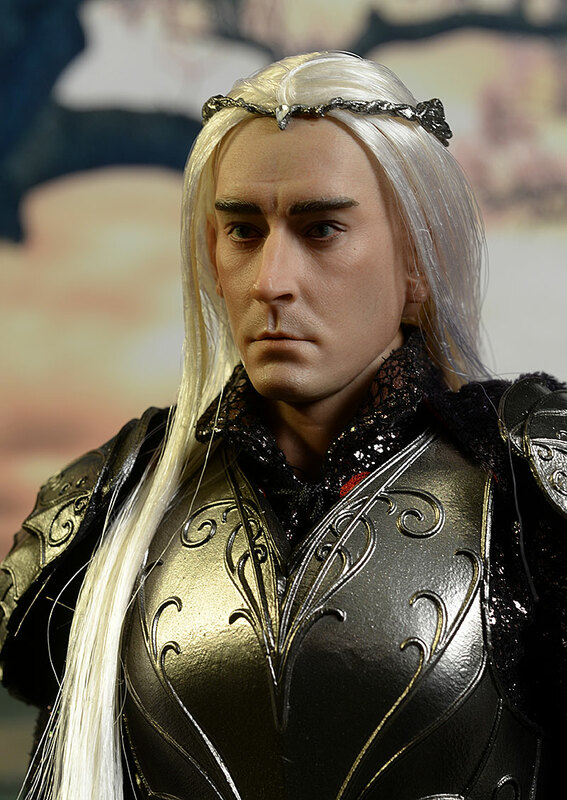 Thranduil comes with his hair styled well back behind his ears (in the photo below, I had pulled it forward slightly), and they've used a hair product to keep it in place. Mine had a weird knot on top of his head where the various strands converged over one another, and the hair product took away much of the fine, thin, flowing appearance. After taking the photo below, I washed out most of the product and played with the hair. The rest of the photos in the review are after this, although there will still be lots of variation, since the longer I messed with the hair, the more I liked it. There really isn't any 'styling' going on here - it's just long hair. It's more a matter of getting it to lay just the way you want, either down the back or over the shoulders. I found that my favorite look was with one side over the shoulder in front, and one side down his back. Either way, by futzing a bit with the hair I was able to cover the ears properly and get a much, much better looking result. I was also able to get the hair to lay much better on top of the head - just compare the photo below with the one included after the Paint category. 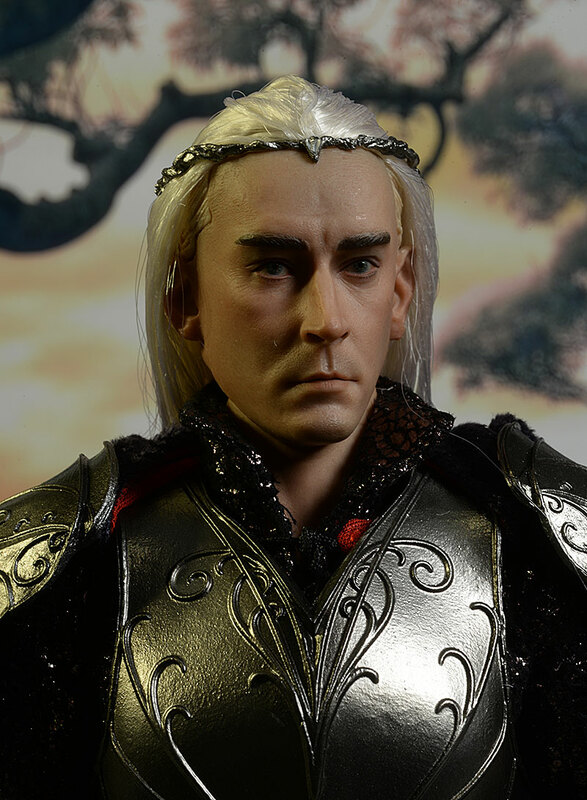 But what about the Lee Pace likeness? 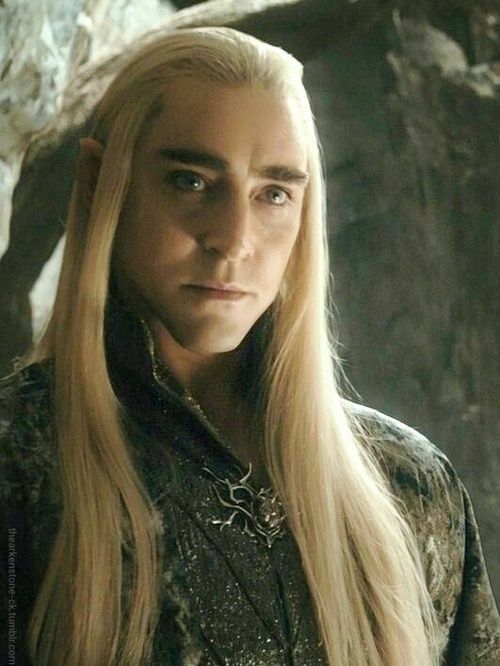 That's the actor who played Thranduil in the films, and who they are copying here. 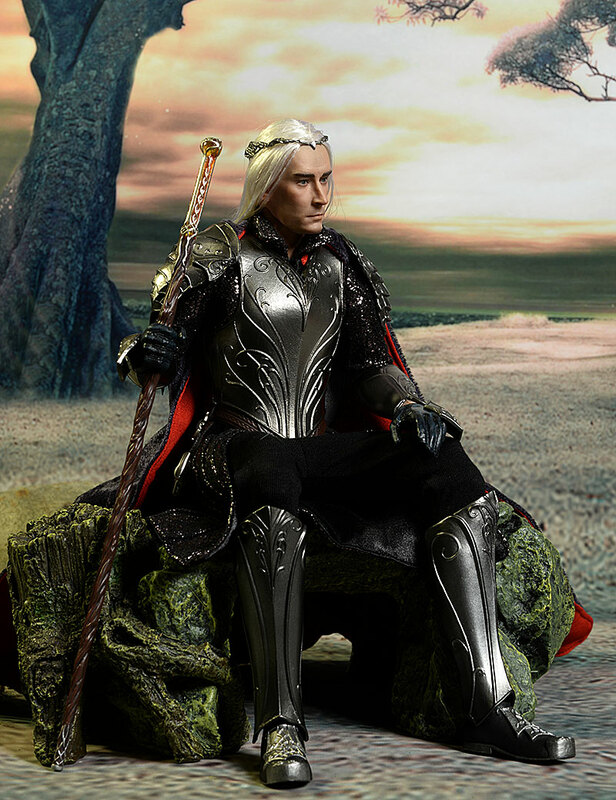 I used a couple stills for comparison - this one, with him ready for battle, and this one with him in a rather relaxed pose, at least for an Elf. The sculpt is quite accurate, particularly in the shape of the face and the nose. The slight skin texture is just about right, since they couldn't go crazy but still needed to create a realistic look. There's a couple paint issues that could have made the underlying portrait even stronger, but more on those in the next category. For this category, once you get the hair looking a bit more film accurate, you'll be extremely happy. One of the things that sets apart a figure are tiny high quality details. 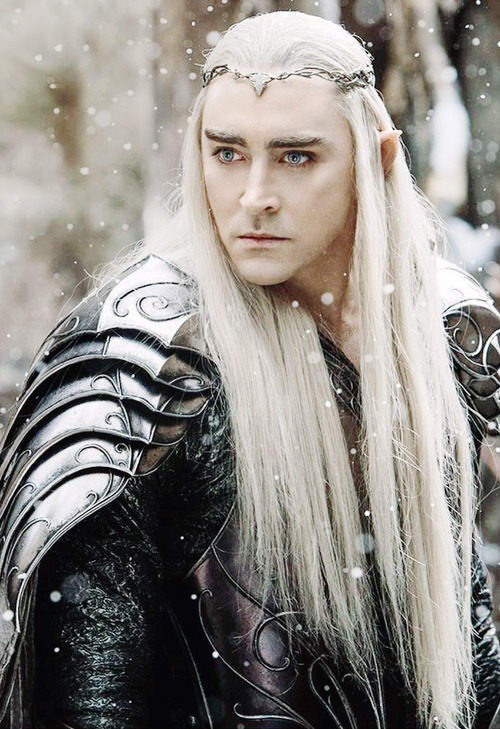 Once such detail on Thranduil is the small crystal at the front of his crown, which is clear and diamond-like. They could have just gone with a painted, sculpted look, but using a separate clear stone, even for such a tiny spot, is the sort of attention to detail that impresses. It's also worth discussing the great sculpt on the hard plastic armor. The greaves, gauntlets, shoulders, torso - all the armor pieces look fantastic, and the sculpted filigree is nicely defined. There's even the feathers on the back, hidden a bit by the cape, which can be fluffed and futzed to your preferred look. 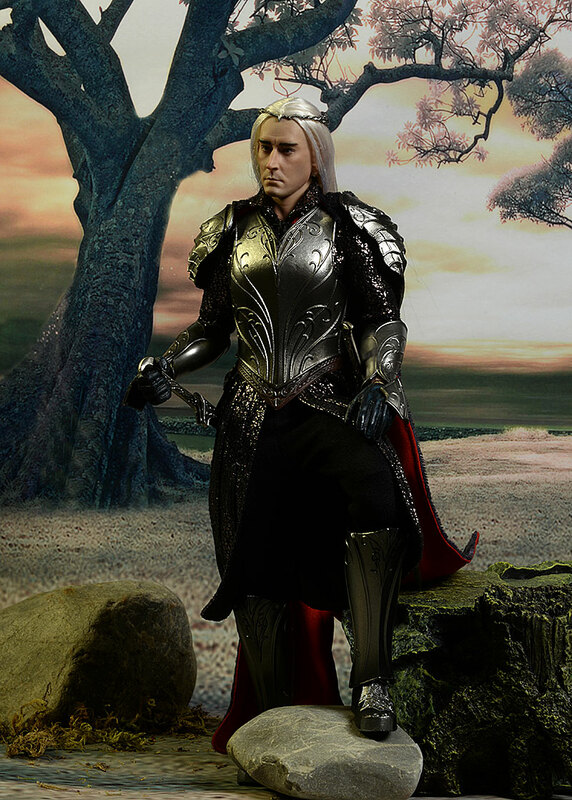 Thranduil stands just over 12 inches tall, and will fit in nicely with the rest of the Asmus LOTR/Hobbit line. 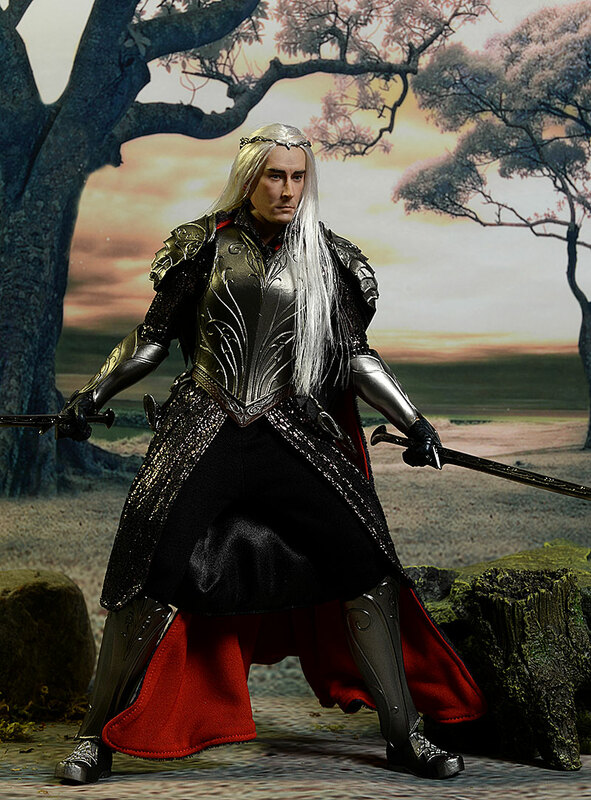 The paint work on Thranduil is good - easy B work - but doesn't quite make it to the next level. I do love the white hair, and it is very light and fine. In some photos it might look like it has tinges of blue or gray or black...that's not in the hair, but rather reflections of the colors around it. The hair is so translucent and fine that depending on the angle of the light, it can show colors below it or around it. Put a piece of white paper behind it, and it's pure blonde again. 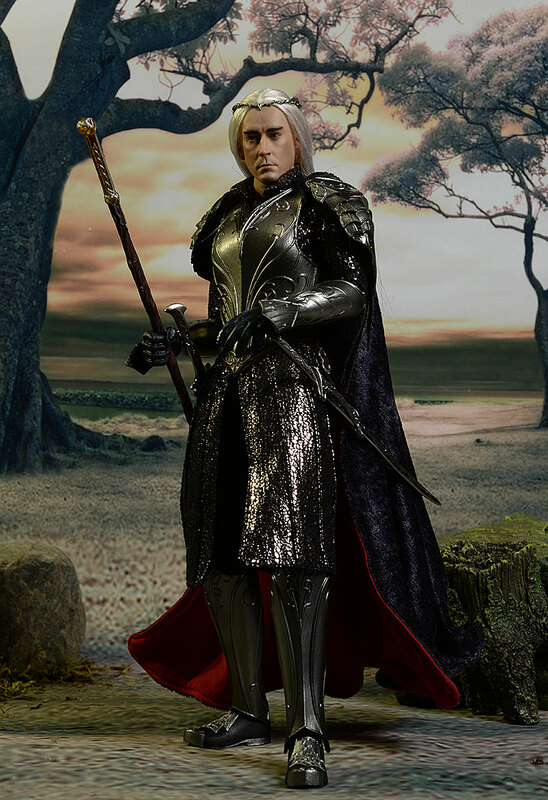 I think they recognized this effect, because they wisely painted the scalp a very light color, allowing the hair to remain very white on the top of the head. The skin tone is very even and clean - critical for an Elf. This could even be a smidge paler, but it's not a major problem. Likewise, the caterpillar eyebrows are clean and neat, but could be a smidge darker. They were quite obvious in the film but here they are a bit more...normal. The eyes are even and sharp, and there's no stray marks or slop. The paint work on the armor is another highlight. It creates a hammered look to the 'metal', and while it is consistent and clean, it doesn't hide or obfuscate the sculpted details. The underlying body has all the proper sixth scale articulation you expect. The armor is a little restrictive, but not as much as I'd anticipated. The neck works great, and the ball joint below the jawline allows for plenty of realistic tilt and lean action. You can add just the right amount of Elven attitude to any stance. The shoulder armor does not interfere with the normal movement of the double rotating hinge shoulders, and the pin elbows and rotating hinge wrists are good for just about any arm pose. 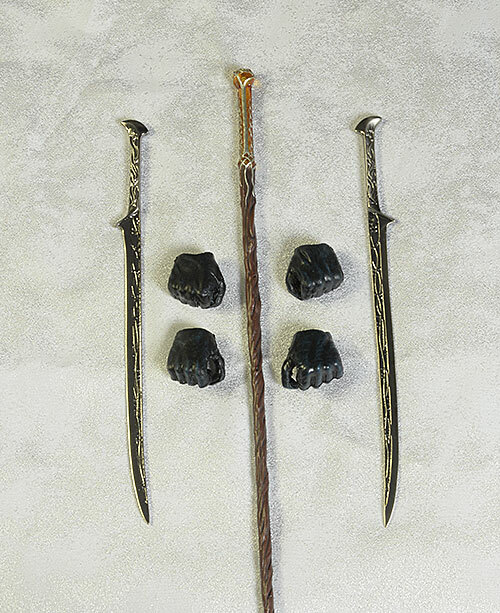 The swords are real metal and fairly heavy, but the arms were tight enough to maintain battle stances. The torso can't do much bending at the chest of course, thanks to the armor, but the waist itself can turn and lean a bit. The hips, knees and ankles can take deep fighting stances, but I did find that all these joints are a bit looser than I like. The ankles were particularly annoying, but I did find that if I forced the greaves down tight on the feet in any pose, it was more likely to hold it long term. The ankles themselves could use a little more rocker movement, but it's a minor nit. Overall, good body, decent posing, but loose joints in the ankles keep him back from getting another half star here. He doesn't have a ton, but what he has is extremely well made and looks terrific. He comes with a total of six hands - three sets. There's a set of relaxed palms he comes wearing, plus a set of fists and a set of weapon gripping hands. The grips could be a little tighter for the swords, but in general these six options will give you plenty of posing potential. They swapped easily enough with no fear of breakage, but just in case Asmus threw in a couple more wrists posts. 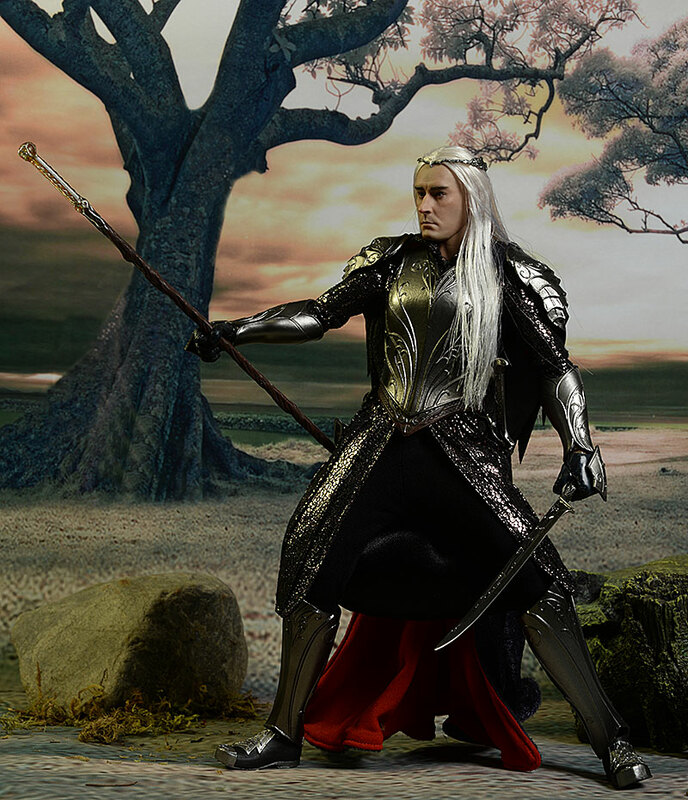 Thranduil also has both of his beautiful swords, with intricately carved designs in the hilt and blade. These are metal and very solid, making them somewhat heavy. But they look fantastic, and fit in the scabbards on his belt perfectly. More on those scabbards - another highlight - in the Outfit section. His staff is relatively short, but that's accurate. The top is graced with a translucent stone, much like amber, and the sculpting and paint look terrific overall. He has two display base options. There's a standard black base, if you're looking for consistency, or the very cool sculpted diorama base of a broken pillar. I've included a shot of him on the pillar later in the review. You can attach the crotch support to either base. Like the Gandalf rock outcropping, the pillar screws down onto a circular base. Unlike the Gandalf rock cropping, the screw post is plenty long enough to work with, and attaching the two pieces is quite easy. While many things about this figure please me, none do so more than the outfit. It's a terrific piece of work, and Asmus has created a complex costume with very high quality materials. As I mentioned in the sculpt and paint sections, the pieces of armor look fantastic. Everything fits tightly and cleanly, and actually restricts the poseability much less than you might expect. Under the armor he's wearing a pair of tight fitting black pants, perfectly tailored. 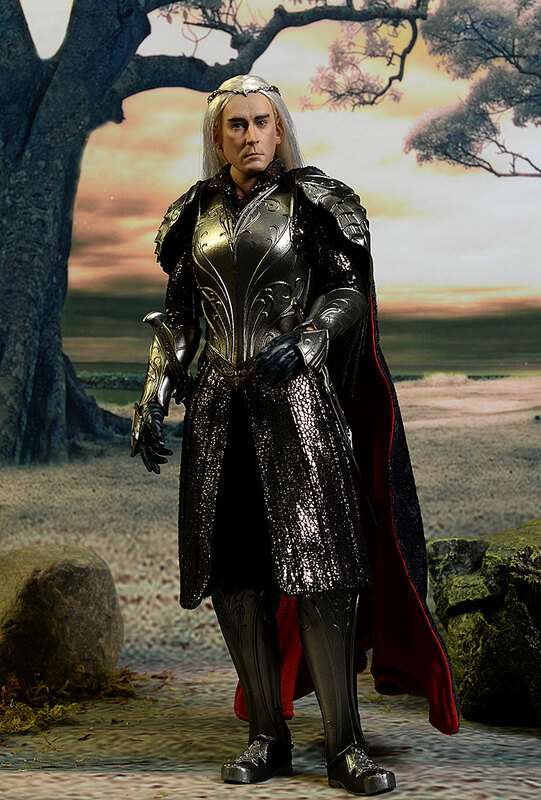 Also under the armor is a long, shimmering coat, that has an ethereal look. The sparkly material evokes Elven strength and personality, and is very high quality stuff. The lining of the coat is a dark black material as well, and all the stitching and construction is top notch. One of my favorite aspects - among several - is the double scabbards on either hip. These are attached to the torso armor (not the waist) with a single well made strap, but they hang perfectly. The swords slide in cleanly, and they still hang perfectly. They scabbards are balanced just right, and the single strap means they are much less likely to get in the way when posing. Outstanding! That might not be the best feature, however. I'm also in love with the cape, made from a dark blue velvety material and lined with a bright red. This is the sort of cape that is attached to the armor at the top of the back and starts out narrow, flaring out wide at the bottom. It is not intended to ride over the shoulders. There is a wire around the outside edge to improve posing, and it really does look and feel fantastic. I'm loving this cape. You don't have to do a lot of futzing with the hair to get the look you want, but you'll end up doing more, simply because it's fun. This isn't some sort of complex hair style where it has to be curled or coifed just perfect - it's long, straight hair. That means it's easy to work with, even for klutzes like me. The hair is also well attached, making it less likely that strands will pull free. Add in the great accessories and costume, and you'll have plenty of fun finding the perfect pose. Most figures in this scale are $220 these days. The complexity of this outfit drives it to another level, and yet it comes in $20 - $30 below average. Add in a tremendously low production run, and you can see why I'm so impressed by the price. Not much, but there's a few things worth noting that I learned while messing with the hair. You don't have to wash out the product, but if you do, obviously be sure to remove the head from the body first. The crown is attached at the forehead very tightly - I didn't mess with it there. But it's merely glued to the hair at the very back, and is quite easy to pop free. That makes washing out the hair with some warm water and getting it to lay properly on the top of the head much, much easier. I didn't even glue it back when I was done, because it sits on the hair and head just fine without the added attachment. If you put the head back on the body before it's completely dry, be sure to put a paper towel between the hair and the cloak in back. I don't know if it would damage the deep blue color (or soak up any of the dye itself) but it's not worth risking. I really wasn't sure what to expect with this figure. Asmus has killed it with their Orcs and monsters in this line, but the humans have been all across the scale, from the fantastic (Saruman, Gandalf the Gray) to the awful (Tauriel) with everything in between. It didn't help that some early photos of the figure right out of the box were less than flattering. But once I had it in hand, I was wowed. From the neck down, he's amazing, with a complex, high quality outfit well worth quite a bit more than the asking price. Minor issues (loose ankles) are exactly that - minor. The head sculpt needs futzing, due to the rooted hair. 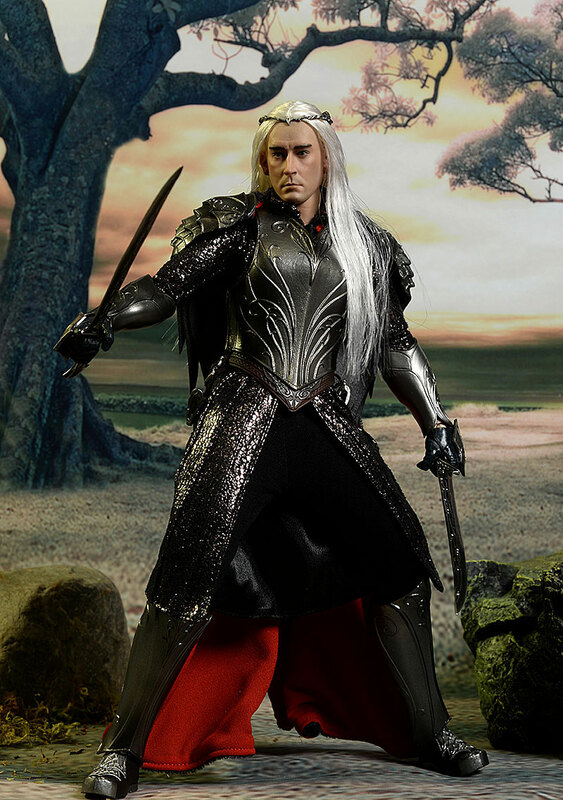 I think the base sculpt and paint job are good, certainly much closer to Saruman good than Tauriel bad. The hair takes a little effort but the final results are well worth your time. 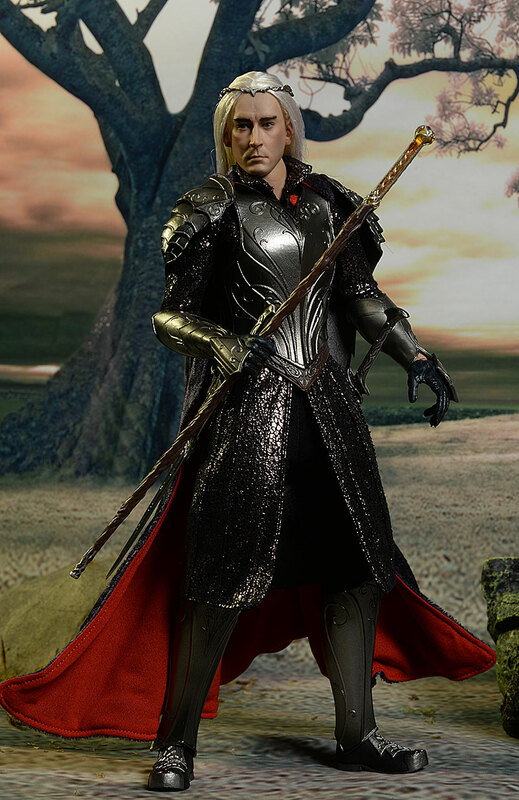 With this figure in hand, I'm really, really stoked for the up coming Legolas. The pre-production shots of the portrait have been good, and if they can get this quality out of the rest of the figure, it will be a winner. Of course, with characters like Thranduil being produced, we'll need a young Bilbo too...and I have to find a sixth scale elk-moose. Maybe a Megoloceros can stand in? - you can pick him up directly from Asmus for $200. - has him for just $190. - Entertainment Earth has him at $208. I've covered all the Asmus LOTR/Hobbit releases so far. Most recent was Sam and Frodo, with other reviews of Grishn'akh, Gandalf the Gray, the Mouth of Sauron, Merry and Pippin, and the excellent Saruman the White. Asmus has also released Tauriel, Aragorn, Bard the Bowman, Eowyn, the Nazgul Steed, the Morgul Lord, Gandalf, Gothmog and Guritz. 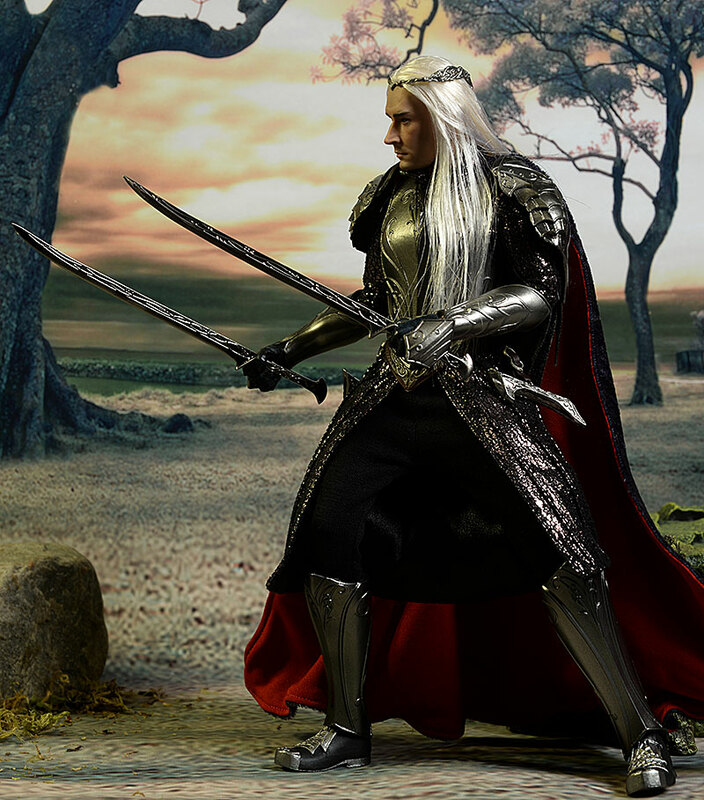 Other sixth scale LOTR figures include these by Sideshow - Gandalf, Sam and Frodo, Aragorn, Faramir, Boromir and Legolas. And don't forget the Aragorn from ACI. Toybiz produced some 12" figures as well, including Gimli, Aragorn, Galdriel, Gandalf, Arwen, and Frodo. Dragons in Dreams did several as well, including Gandalf, Aragorn, and Gimli.